This seems like the perfect time to check the status of my early predictions for this season’s awards. Spoiler alert: it isn’t pretty. But I’m willing to give it another go at the midpoint of the season so here it is: my mid-season picks for who I believe will win the NBA awards. Well, this one is kind of awkward; I definitely had higher hopes for Brandon Ingram. I truly believed he was really going to blossom into this sharp shooting wing that could help put up big numbers to give Lebron some ease when he needs it. However, that wing is actually Kyle Kuzma. Brandon Ingram is having a fine season, but not to the extent I assumed he would reach. Hell, the Lakers threw him (and pretty much everyone) into that proposed trade for Anthony Davis. Meanwhile in Toronto, Pascal Siakam is having a breakout season I doubt anyone outside of our neighbors up north really anticipated. On nights where Kawhi has been out, he has stepped and been the scoring they have needed, recently scoring a career high 44 points. Add that to his impressive and still improving defense and it is nearly a lock for Siakam to raise this trophy by the end of the year. Kawhi Leonard’s defensive instincts are still on a completely different level; there’s no denying that. The numbers are a little absurd. However, take into the account that Kawhi has missed quite a few games, so that has to mean something. Paul George on the other hand has been a defensive menace all year. Rarely do you find him out of position and he sticks to his man like glue. He’s leading the league in steals with 2.3 a game and also has a great rebounding rate, averaging eight per contest. Paul George has a great chance at winning this award, but honestly he should be up for MVP as well. Julius Randle has had a solid season with the New Orleans Pelicans. Early on in the season, he was the spark plug for the team. He brought a high level of energy that the opposing team wasn’t ready for. With a lot of those games being losses - along with the Anthony Davis saga- it has gone largely unnoticed. In fact, due to Anthony Davis’ injuries and other factors, Randle has been inserted into the starting lineup which will undoubtedly move him out of the Sixth Man of the Year race (just for fun, he’s averaging 20 points and 9 rebounds per game…Oh Lakers. We had this guy). My new pick is out in Indiana and has been a steady force for their bench . Domantas Sabonis has been scoring well (14 points a night) rebounding well (nine) and has been doing at an effective clip, shooting over 60% from the field. With Oladipo going down with a season-ending injury, it is efforts like Sabonis’ that have really kept this team afloat. Dwayne Casey did have the Pistons playing some pretty good basketball. Now, they are hanging on to the last spot in the Eastern Conference standings. Besides Blake Griffin (who probably doesn’t want to be there anymore) and Andre Drummond, the Pistons are devoid of talent with a major impact. What they really need is improved guard play and better wings to ever fully take advantage of their frontcourt. In Milwaukee, Coach Budenholzer have the Bucks with not only the best record in the East, but the best record in the LEAGUE. Impressive doesn’t even begin to describe the job he’s done so far this season. We knew he was a good coach in Atlanta but seeing what he can do with a top 5 talent has been nothing short of astounding. With respect to Trae Young who has really come into his own after a rough start and Deandre Ayton, who has been very consistent…I said what I said. Steph missed a decent amount of games and it proved his value as the team acted like they were clueless during that time. He’s still having an amazing season but I don’t know if it’s going to net him the MVP. This race should be including Paul George who has been a PROBLEM for the entire season but definitely over the last month or two. I also like to casually point out that Russell Westbrook is averaging a triple double for the third year in a row and no one cares for some reason (I know what the reasons are but it’s not the time for that just yet). Nikola Jokic is the dark horse contender; he’s been racking up triple doubles this season with his deft passing ability to go along with his scoring and rebounding. But this year’s MVP race is down to two people: James Harden and Giannis. Harden has been on the greatest scoring stretch since Kobe Bryant and the longest since Wilt Chamberlain’s many streaks. He single-handedly dragged the Rockets from out of playoff contention to the contenders they started the season out as. With that being said, I can’t give James my MVP pick because I think the streak is slowly creeping into his style of play. I think Harden is so fixated on that streak that it is affecting some of the game results for the Rockets. Since the new year rolled around, the Rockets are 12-9, with a few of those losses happening to the Magic and Pelicans, two teams who won’t make the playoffs. They’ve also loss to a very game Nets squad, who while vastly improved, shouldn’t be beating the Rockets. They also got smacked by the 76ers by 28 points in that stretch. But the headline out of all those games? Harden maintaining his streak; sometimes even at the tail end of games. It’s almost as if the focus was more on that rather than trying to get the win. I said all that to say Antetokounmpo doesn’t have those types of issues. 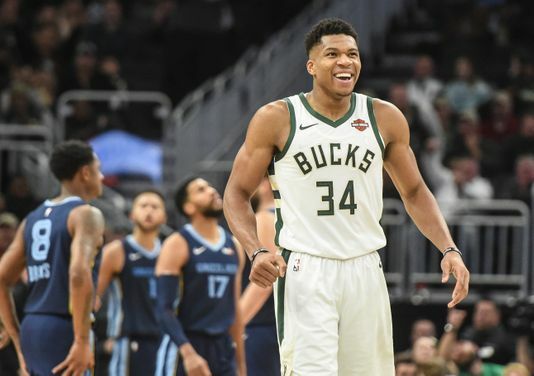 He goes out there and teams can’t do a thing to stop Giannis or his team. He doesn’t let scoring affect how he plays the game and that in turn has led them to the top of the league. Also, he’s modeled consistency all year and doesn’t show any signs of slowing down. With averages of 27 points 12 rebounds and six assists, Giannis is sitting pretty as my MVP candidate going forward.